Our programs follow the Vancouver School Board schedule and run September through June. To inquire if we have space available in our current or upcoming programs, please contact us. This truly unique program for toddlers (2 year olds and those turning 2 by December) and their parents grew out of an in-depth pilot study conducted in the 1980s at the University of British Columbia. Research results have confirmed the direct relationship between parent involvement in their children’s education and the level of child development and educational success. The program name Addressing the Needs of Children through Observation and Response, ANCHOR, is not only relevant as it describes a context for parents and educators to act and interact in authentic and meaningful ways, but also because it alludes to how the program anchors the way parents frame their relationship with their children’s education. 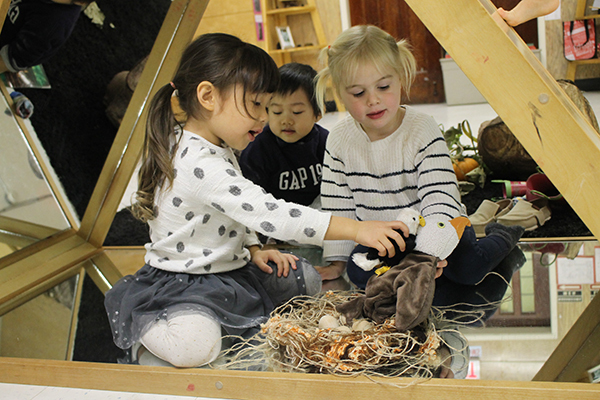 The 2 year olds are invited to explore and create in our nurturing and stimulating environment that responds and evolves as their interests transform. They are provided with a wide variety of beautiful materials and activities to investigate and are encouraged to interact with each other and solve problems. While two teachers engage with the children, parents observe their children via video transmission in an adjacent room with our parent facilitator. Through observation and discussion, parents build shared understandings of different learning journeys as they embrace multiple perspectives and ways of knowing. The Anchor program provides an opportunity for parents to gain insight into how a Reggio-inspired program can enrich the experience of raising and nurturing a young child, and connect with other families in a supportive and informative environment that transform into community. The class size is limited to 9 children and parents are required to stay on site during class. Healthy snacks, that are predominantly organic, are provided and both teachers and children eat together and converse about their experiences. We are closed for two weeks for winter break and two weeks for spring break (as per the Vancouver School Board Schedule). In addition to Statutory holidays, we are closed for Easter Monday. *VCSC operates as a not-for-profit society. Tuition and fees are subject to change. Our preschool program consists of mixed-age classes of kids who are 3 (or turning 3 by December), 4 and turning 5. The curriculum, based on the Reggio Emilia approach, involves activities in all areas of development, including art, music, science, mathematics and early literacy. We take pride in offering a secure and stimulating environment where all children can thrive both creatively and socially. We have daily active play and encourage children’s innate love of nature. Our onsite playground was custom-built for preschool aged children. We offer many enrichment opportunities throughout the year, including field trips and in-class guest experts. Our preschool program is run by 3 Early Childhood Educator-certified teachers, resulting in a teacher-student ratio of 1:6, one of the best teacher-student ratios in the area. We strive to keep an equal balance of ages in each class. A healthy snack – that’s organic whenever possible – is served family-style each day. We are closed for two weeks for winter break and two weeks for spring break (as per the Vancouver School Board Schedule). In addition to Statutory holidays, we are closed for Easter Monday, and for several days during the school the year for professional development. “The Anchor program is a lovely introduction to the school and has really helped with our children’s transition to independence in the classroom. It’s also a fantastic way to get to know the other families attending the school. Each of our children has loved their time there and thrived in different ways. All of the teachers are fantastic. The emphasis on play-based activities and the focus on creativity, building and art enrich their experience of preschool while still encouraging their early socialization and independence with their peers in a warm supportive environment.” - Helen M.